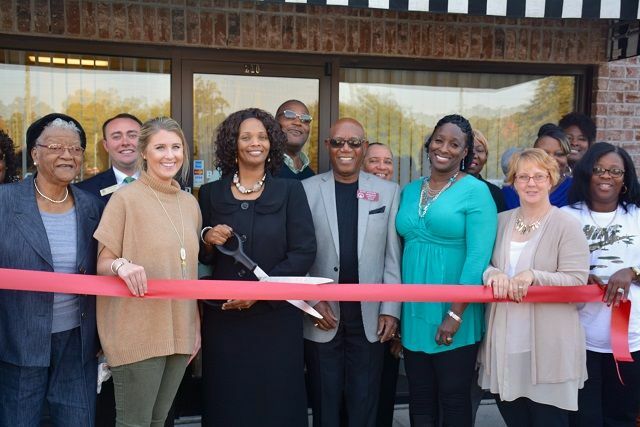 SAVANNAH, Ga. - Nov. 17, 2016 - PRLog -- Stewart Income Tax & Business Services held a ribbon cutting for their new Savannah location at 4395 Ogeechee Rd #210. "Our goal is to serve our clients but also to serve our community," said Jennifer Stewart, owner. "We felt that Second Harvest helped so many during the hurricane; their pantry has been hit hard. If we could raise awareness for their needs during our grand opening celebration, we felt that it was worth the extra effort." Stewart Income Tax & Business Services was originally founded as a home-based business in 2014. ​They are an authorized e-File provider for the IRS. All of the preparers are Registered with IRS. The owner, Stewart, is a member of the National Directory of Registered Tax Return Preparers and Professionals. The office has also joined the Savannah Area Chamber of Commerce. "We have always been extremely proud of the personal, low-pressure approach and high-quality services that our firm provides," Stewart added. "But now, we're very pleased that our expanding roster of clients has allowed us to move to this larger, more convenient space." For more information, call (912) 358-0894, email info@stewartincometax.com or visit online at http://stewartincometax.com. Stewart Income Tax & Business Services is a locally owned and operated business, located at 4395 Ogeechee Rd #210, in Savannah, Georgia, 31405. The office offers tax preparation for individuals and small businesses, bookkeeping and payroll services. Primarily serving clients in Georgia, Florida, Alabama and Texas since 2014, Stewart Income Tax & Business Services offers tax preparation for all 50 states. The company provides secure, personal service and holds to a higher standard than most "commercial" tax preparation offices, extending a 100% guarantee to clients and standing behind all returns they prepare. Its seasoned staff is knowledgeable of tax laws through continued education, experience and training, enabling Stewart Income Tax & Business Services to maximize refunds by skillfully knowing and researching tax laws for credits and deductions clients may qualify to receive. The office is open year-round at 4395 Ogeechee Rd #210, Savannah, GA 31405, Monday through Friday from 9:00 am to 4:00 pm with expanded days and hours from January through April. Walk-ins are welcome. For more information or to make an appointment, call (912) 358-0894, email info@stewartincometax.com or visit online at http://stewartincometax.com.